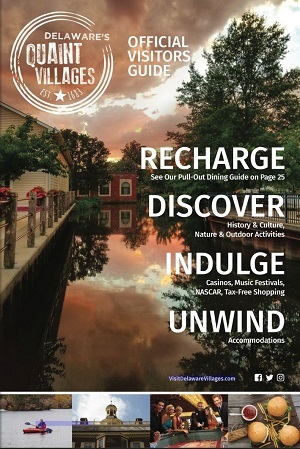 The convenient locale of Delaware’s Quaint Villages makes planning a vacation simple and headache-free. We are located between Philadelphia and New York to the North, Baltimore and DC to the West, and Virginia to the South. We are within 2 hours of Reagan International Air, Baltimore-Washington Airport and Philadelphia International Airport. Take US 50/301 across the bridge. Follow US 301 North to Maryland Route 302 (right turn at mile marker 102). Turn right onto Maryland Route 454 at Temple Ville. Route 454 becomes Route 8 at the Delaware state line. To Get to Dover, turn left onto US 13 North (N. DuPont Hwy.). Take I-95 North to US 50/301 across the Chesapeake Bay Bridge. Follow U.S. 301 North to Maryland Rte. 302 (right turn at mile marker 102). Turn right onto Maryland Rte. 454 at Templeville. Rte. 454 becomes Rte. 8 at the Delaware state line. Continue on Rte. 8 until you reach Dover. At Norfolk, cross the Bridge-Tunnel and follow US 13 North, approximately 170 miles from the Bridge-Tunnel to Dover. Take I-695 (the Baltimore Beltway), take I-95 North to Exit 4A, Route 1 South. Follow signs towards Dover. Take the turnpike East to the Valley Forge Exit, then US 202 South to US 13 South. Follow US 13 South to the split with Route 1 South. Take I-95 South through Wilmington to Route 1 South.